I wasn't sure if anyone would actually ask me anything but yesterday I opened my email quite late in the evening, around 11:00, and there it was, an email. "Hi! You told me to e-mail you with questions. 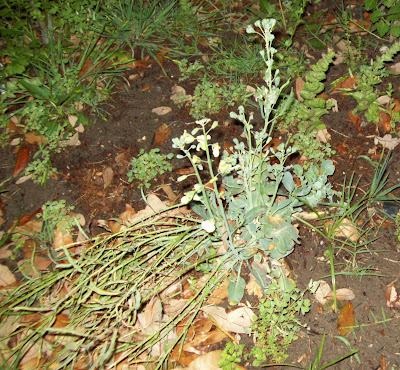 Talking to a friend at church this morning, we are both having problems with our broccoli plants going to flower (seems like) too soon. Any suggestions? Thank you." Well, I have had the exact same problem. I like to plant something and just let it grow the first time to see what happens under normal conditions. I really like things that just grow without me having to nurture it alot. The thing about broccoli is that it likes cool weather. If you need a jacket then broccoli is thrilled, at least as much as a plant can be. It can take below freezing temperatures and likes it. This is a winter vegetable as far as eating the florets goes. Once it gets above 70 degrees it thinks it's time to make babies which means all that lovely veggie goodness you have come to know a broccoli becomes yellow flowers. This isn't bad as long as you want seeds for more plants next season. To solve this problem there are a few things you can do. Depending on the temperature depends on how much you need to do. The object is to keep the roots cold enough that the plant doesn't think it's warmed up yet. First off you can mulch around the plants to insulate the ground. As long as the average temperature, that is day and night, is still well below 70 then this may be enough. Second, you may need to water frequently. Let the waterhose run for a little bit so that the cool water from the underground water lines starts to come out so the cool water can bring the ground temperature back down. Third, and this is something I have done just to keep moisture in the ground is to use ice. Don't worry about killing the plant. What will happen is that the sun will melt the ice and nearly freezing water will saturate the roots. Once again this goes back to my citrus growing. I had my lemon tree on the back porch of the office where it was getting hot and I probably needed more dirt in the first place. I realized that our ice maker made an entire bin of ice every day and I figured that it needed to be used. So, I poured it on the dirt making sure it wasn't against the trunk and there you go. It kept the soil moist for hours during the hot part of the day. I went to Prairie Fest today or possibly yesterday since I am writing after midnight. If you were there and talked with me then thank you so much for actually visiting the site. As I hopefully told you I will do my best to answer any gardening question you might ask me as long as you don't live too far from the DFW metroplex, and even then I might still try. I didn't take any pictures of the park but it is well worth visiting, Tandy Hills, 3400 View Street, Fort Worth, TX. There were many groups out helping to support the environment and use renewable items. And then there was me. I guess gardening is trying to help the environment. It at least help to relieve stress. I've decided to go a little rough with the squash and melon patch until we can get a better garden design in the area under where the mimosa tree used to be. It's in a mound of excess dirt that piles up and is pretty rich for growing things. There are also some pepper plants growing in the middle of them which I wasn't sure would grow since they were just tossed out there for giggles. Now there are so many sprouts that they will need to be thinned out quite a bit. I might end up transplanting them into pots for the fall plant swap. Already producing pepper plants should go over ok. The bamboo pile isn't very big. I figure a few more this size should do it for the fence. The veggie and flower beds shouldn't be affected by it since they are far enough away that the sun will be above the top of the fence before it's above the top of the neighbor's trees. 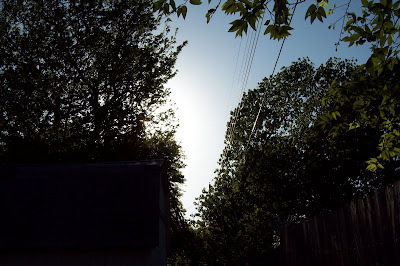 The northwest patch has a little extra sun in the evenings due to the power lines running down the property line. Just in case you were wondering, I do have bamboo in the backyard. It is not however runnign rampant. It is not digging under the house. It is not invading the neighbor's yard. It is not planted in the ground but in a pot. Otheriwse all of the above might not be true. Granted I have never seen bamboo try to come up inside a house but it might cut across a corner to reach the other side. I have had it in a pot for two years now and it finally has decided to send up some new shoots. I was wondering if it ever would or if it would just stay green forever and get bushy. I guess I should clarify that and say it is sending up a new shoot since there is only one so far and it's only about five inches tall. If it keeps making new shoots I might just transplant it into a new pot one that is longer and wider so i can have parts to repair the fence. You never know when the neighbor's dog might want to chew a bit off of it. While I'm on the topic of new shoots, my lemon tree seems to have acclimated to the bakc yard and has decided to continue growing for a spell. I just hope the rest of the citrus plants take it's lead and keep growing. 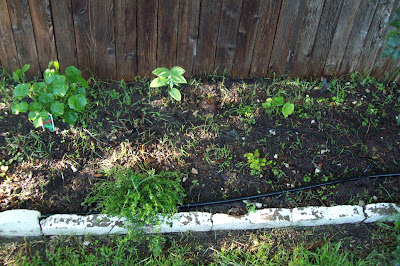 So far the Kaffir lime has come to a halt and the key limes are barely crawling up out of the dirt. I have undertaken the huge task of building a fence out of bamboo. If you know much at all about bamboo you can breathe easy. I'm not planting it. 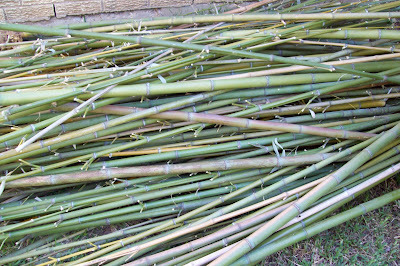 Instead I am taking the bamboo that others have cut out of their backyard or sideyard or front of the house. The last load of canes was taken from a house where the new owners who had recently moved in had put on Craig's List. I am nicer than most in that my wife and I not only took the pieces we were able to trim and strip before the sun set, well before a few hours after the sun set. We also helped bind the clippings and put them on the side of the street for the trash to pick up. I have finally with my wife's help put all of the pieces in the backyard to be lashed together. This will probably take many months to complete since I still don't have enough cane to finish the project. Maybe a third or fourth. There are unfortunately no pictures of this yet as it was again dark by the time we stacked them up where they will sit for a few days at least until I have the time to trim the remaining stalks sticking off the sides of the canes. Don't worry though, there will be pictures, lots and lots of pictures. It seems like I might get some spring figs this year. Usually the wind and rain dash the newly forming figs off of the branches leaving them to rot in the wet grass, but it seems that they have weathered well this year and will make a good harvest if I can get to them before the birds do. My grandmother always liked making a fig preserve which she told us tasted like strawberries, and did a little. I only hope mom or some other relative still has the recipe somewhere. I don't remember seeing it in the family cookbook they put out a couple years ago but that doesn't mean that someone doesn't know it. One of my favorite recipes from when I was little was in there. Which would go great with a little homemade bread and fig preserves. I went to a nursery recently and was told outright that citrus plants don't do well in our north texas climate, yet my wife was able to buy oranges grown not too far away. Here in the center of the DFW metroplex the temperatures don't get quite as cold due to the abundance of heat produced by the millions of cars that drive around on the ever expanding heat absorbing and radiating roads, highways and interstates. As long as you can find a good place to conceal it from the onslaught of the winds that can get in excess of 30 mph on very windy days even in the sprawling neighborhood areas where I live during the cold weeks of winter and posibly cover it for temperatures below freezing. I say weeks because as we all know here that there are only three seasons, almost summer, summer, and it will warm up again tomorrow. Very seldom do we have the problem of snow or ice and when we do it usually doesn't last past lunch. Anyhow, one of the seeds planted from said texas orange has sprouted in the pot in the break room at work. It is much larger than the lemon sprout but doesn't yet have any signs of making any true leaves yet. Not that I'm suprised since it only sprouted last week. My key lime sprouts are doing wonderful. There are about a dozen of them now and counting ( I planted around 40). Stay tuned for more excitement from the citrus world. 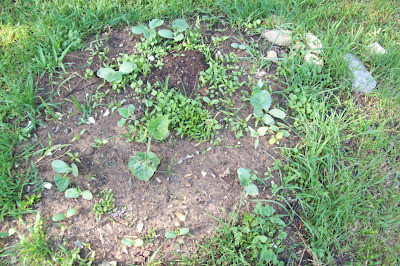 On a different note, the melon and squash patch have taken off like I wouldn't have believed. I may have to thin them out before long so there is enough room for all of the fruit to mature. I'll definitely have to fertilize. The garden swap went well. There were only about 10 tables there with a few plants that were of interest to me and my wife. Among these were tomatoes and tea roses. 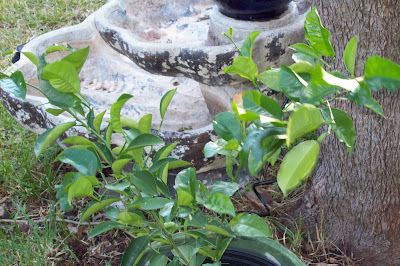 Hopefully by fall when it comes around again my key lime trees will be ready for trade. I don't know when it will be in the fall but i will definitely post it when I know. 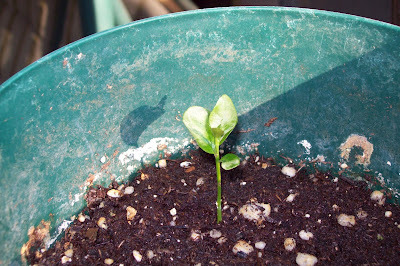 Yesterday I looked at the pot with the key lime seeds and there were a few sprouts. I really should have watered the pot but I'll do that later today. As for my kiefer lime tree sprout, it's doing fine. After I put it out in the sun it had a little shock and some of the leaves turned color but new leaves have already sprouted and it's growing as well as can be expected. The lemon tree is great, no lemons yet but I really don't expect to get lemons for at least another few years. I might plant it in the ground this year or next depending on how much it grows this year. My only worry is that it gets pretty cold and I'm not sure it will survive the winter outside especially if I take too long to get it in the ground. I am attempting to grow tumeric in the shady part of the backyard next to the house. It shouldn't get too high so I put it in front of the lemon balm near the oxalid. So far there has been no sign of it wanting to grow and I'm not sure if the root I got is even able to grow again. This country is opsessed with a plant that we really can't do without anymore and it time to start planting it. That's right, it's time to plant corn. I suggest you find a nice sunny place possibly on the north side of the garden near the beans since these will be able to provide much needed nitrogen to the corn. The corn stalks also provide a wonderful climbing medium for the beans. Use whatever variety you can find at your local nursery or garden supply store. Ok, so it's now mid-April, but there's still time to do some fantastic gardening. For instance, there's still time to get those tomatoes in the ground before the heat comes, and it always comes. It's also the last chance for beans. More important than that though it's melon time. Although you could plant watermelon last month, you can now also plant cantaloupe and honeydew and all those other melony plants. In addition to these it's also time for cucumber, eggplant, peppers, pumpkin, okra and peas. 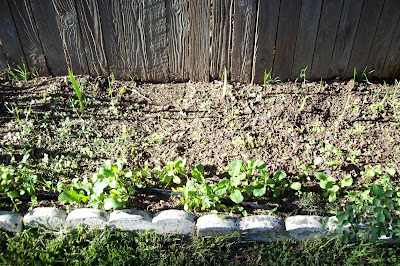 The little seedlings are still under the dirt. I've tried everything to get them to come up to no avail. A few of them have rotted and turned brown but a few have the little start of a root which I hope will keep going. The dirt is a little moist so I have decided to put the pot in full sun and dry it out a little. If this doesn't work I still have over ten key limes to try again. I think I'm using the wrong dirt to start with so I won't be too upset if none of them survive. They're not new or unusual, but I have added my profile and a list of my blogs and other sites I have begun to work on. It will take years possibly to have them grow into mature sites and blogs, just as this blog has taken some time to get going. Currently there are anywhere from 0 to 15 people visiting a day with an average of 4 visits and very few people clicking on the ads (not that that is the reason for the site but it does help in the long run). I am just that determined though to keep at it until all of the sites are updated at least weekly if not daily. Seeing as my lime tree as opposed to evrything else seems to be the main attraction here, I figure I should post an update on it's progress. It's still hanging in there and doing fine. There's another new leaf forming but still not the classic double leaf that you've come to expect from a kaffir lime tree. Still, it's something. I have taken both the kaffir lime and the lemon tree outside for the summer where they will weather the elements until probably November to December when it starts freezing. I want them to be able to acclimate, not die.Below are some pictures of their current placement and condition. I decided not to take a picture of the key lime pot since it just looks like a pot full of dirt and who wants to look at that. As you can see, the lemon tree has lost some leaves in the move but is still doing great. I put it next to the fountain so it can keep just a little cooler from the breeze waftingn over the water toward it. This may not help but it doesn't hurt. I've had to watch all of my pots since the squirrels have been having a pecan hunting party all over the place, including my little 2" pots. Come on, there are no pecans in a newly planted pot so shooo. 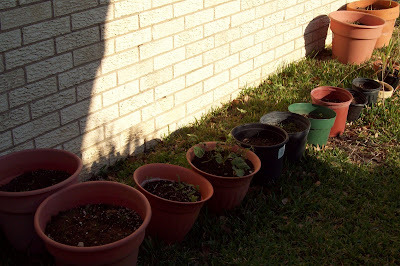 This last picture is of some of the many (larger) pots planted. Behind the defensive pot wall there are the sunflowers which seem to all want to come up at the same time.